Oh grammar, you tricky beast. Even though I spend my days getting paid to edit other people’s writing for these little problems, even I need to double check the more complicated rules from time to time. It’s easy to slip up and make little mistakes like a misplaced comma here or there, but there are certain rules that we should always be getting right. And now, it seems that even the social media behemoth is now getting one of those major ones wrong. It makes me blush at the nerdiness of a post title like this one, but friends? Pronoun-antecedent agreement (complicated as it may sound) is one of the more basic rules you learn in writing. When you’re using a pronoun (he, she, it, his, hers, theirs) it refers to something earlier in the sentence (Max, Susan, that girl, your classmates). That thing earlier in the sentence? It’s called the antecedent. So let’s say we’re talking about Vin Diesel. I’ll wait while you finish oogling his biceps and liking his page on facebook (seriously, you won’t regret it). 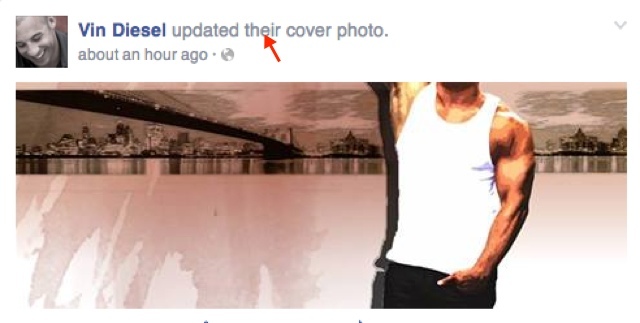 If Vin Diesel is updating a cover photo, we would say HE updated HIS cover photo because he is a singular man, and the pronoun referring to him must agree in number to the antecedent (in this case, Vin, or Dom Toretto if you prefer). If we were talking about the whole cast of The Fast and The Furious (RIP Paul), we would say THEY updated THEIR cover photos because in this case, the antecedent (the whole cast of the movie) is a plural, or a group of people. In gender-sensitive times, it’s become popular to use THEY or THEIR incorrectly when referring to a generic singular word like “a student” to avoid being accused of gender discrimination by limiting the sentence to women or men, but the easy way to avoid this problem is to pluralize the sentence and say students/their. And I get what Facebook is doing. They’re attempting to be gender neutral, and I applaud their efforts in instituting new categories of genders to select. However, with all the technology out there, can’t they script their application to select the gender appropriate pronoun based on the person’s profile selection rather than defaulting to the plural THEIR? We all have a tough enough time remembering those little grammar rules as it is. We don’t need social media to subconsciously reinforce the wrong rules all day when we scroll through our news feeds, even if we do get to look at Vin Diesel while we’re doing it. If you’re torturing over the perfect way to wish your love happy Valentine’s day, there’s an app to the rescue. You’ll be bold, clear and to the point with the Hemingway app. You enter what you want to say, and the website tells you how to say it like Ernest. Just enter text, and different shades of highlighting will lead the way. Yellow means you’re being too word, and you should probably cut down your sentence length. Red will tell you that you’re confusing and your meaning is unclear. Blue will tell you to quit it with the pansy adverbs and pick a verb with power. Purple will tell you to pick a shorter word, and green indicates you’re using the passive voice – don’t want to mistake have loved for love today! Then go have a drink and celebrate a job well done. That’s what Ernest Hemingway would do. I read a whole bunch of websites on the daily (to the tune of 10-20), and one thing I have noticed cropping up more and more are lists everywhere. I enjoy a list as much as the next gal who is into organization. Post-it notes with numbered to-do’s are how I stay productive at work. A list in a notebook by my bed is how I fall asleep at night without worrying about the things I need to do the next day. Programmed cell phone alarms (which are really lists broken down into bullet points) are how I remember to do mega important things for my social life, like remind my book club to show up at our meeting, or buy those awesome concert tickets the absolute minute they go on sale. That being said, I’m getting rather sick of 6 Reasons I Should Do [Insert any activity], 10 New Products YOU MUST BUY, 8 Workout Tricks That Will Change Your Life. I remember the days when this style of writing was a novelty. I would scan the website, and think, “Why YES, how did they know I would love to hear 7 things that will revolutionize my life, and how thoughtful they let me know in advance how long the article is.” They are easy to consume, and kind of fun to click through when you’re in a mid-afternoon daze and want something easy to read. Don’t get me wrong, I get why websites are doing it. Thanks to iPhones, the collective American attention span has decreased to the size of a puppy in a room full of toys (in my totally scientific assessment). There are so many articles to read, so many ways to read them, and so many different sites posting about similar things. Websites want to make their content easy to digest, and give all the busy people a sense of how long it will take them to read it. It’s all a big strategy to encourage more clicks on more articles. But still, it’s making my reading experience a little bland now that everyone is doing it. And even further? I think it’s a bit of a cop out. Why write a coherent article broken up into logical paragraphs when you can just make a bulleted list, and add a few sentences with no transitional statements? It’s chopping up the fun of a good long read into disjointed mini-stories packaged as one. There are some topics that only merit a few sentences a piece, and it can be interesting to group a whole bunch of items into one fun series. It’s just something to think about – are we over using the list? And can it be done a little better (think Slate’s 2M to read summary in the sidebar)? I think it can. It’s National Novel Writing Month (or NaNoWriMo as participants call it), and hundreds of thousands of people are taking their first or twentieth stab at creating a novel. But as those of us who write, either for a living or for fun, know – sometimes it’s hard to get yourself to sit down and put a pen to paper. It’s even difficult to open up that laptop and start typing after spending a day working on a computer. If you just have writer’s block, Chris Baty’s book No Plot? No Problem! has tons of tips on how to slog through. At a loss for a detailed plot map? Even Margaret Atwood will tell you that sometimes you just need to make it up as you go along. If you need even more motivation, it turns out that writing can be good for your health in a few key ways. If you write the old fashion way, with a pencil and a notebook, you can actually improve your memory and learning skills. The act of writing can help you retain information more effectively. If your book is loosely based around a difficult event you went through, writing about it might speed your emotional and physical healing. People who journaled about their wounds actually physically healed faster than those who didn’t. This benefit extends to people battling cancer. Writing has been shown to help reposition the attitude that patients need to fight the disease. With Thanksgiving around the corner, this next benefit is even more timely. Writing down things you are grateful for can help people feel happier or more optimistic about life. If you’re stuck as to where your characters should go, try marking down one or two “thankful fors” and it might just get the creative juices flowing. Then finally, writing can help you sleep better and longer which can make you more resistant to all those bugs flying around, and it can lower stress levels and blood pressure. As cold and flu season ramps up, even if you can’t do convince yourself to write for creative purposes, do it for your health!